Specializing in 18th and 19th century European furniture and decorations. Antique Eskimo sculptures and masks. Antique furniture conservation and restoration. Conservation of painting and icons, sculptures and wood carvings. Feature 22 dealers from across the world. Antiques, Paintings, decorative furnishings. Fine ethnographic art, specializing in furniture and sculpture. European antiques, carved wood, wrought iron, chandeliers, lighting. The gallery of the Mexican culture. 20th century and contemporary British and American, paintings, drawings, sculpture and prints. (CDA) is a professional association of art dealers who represent the highest standards of art and encourage a better understanding by the general public. A group of over 675 art dealers, artline is formed from the combined memberships of the seven art dealer associations that make up the site; Art Dealers Association of America, Art Dealers Association of Greater Washington, Association of International Photography Art Dealers, Chicago Art Dealers Association, International Fine Print Dealers Association, San Francisco Art Dealers Association, and Society of London Art Dealers. Dealers and their sites are found in artline�'s member section. Over 1000 artists, 1500-2000 AD are listed alphabetically by painting, prints, drawing, sculpture, and photography. Also available, are catalogue raisonn�s, books and monographs on artline� artists. Icons and antique pieces in artwork, small sculptures, oriental pieces and carvings. Distinct collection of Asian antiques and ecletic global treasures. We have been specialists since 1980 in the furniture, lighting, metalware, ceramics, textiles and paintings of the American and British Arts & Crafts Movements. In addition, we carry an extensive selection of high-quality, beautiful reproductions that will fit well with an existing collection of antiques or complement and augment your contemporary furnishings. Repair and custom design workshop, specializing in French and art deco furnishings. Inspired furiniture and fine art. 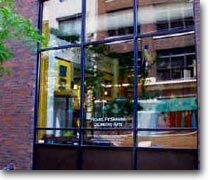 gruen was the first gallery to open in the river north area and the gallery's programs is of contemporary paintings and sculpture.